Don't ever accept an invitation to go fishing in Thailand. You might not come back. Almost daily, bodies are washing ashore along the coasts of Thailand, Malaysia, Burma, Cambodia. These are unfortunate migrants, most of them from here in Cambodia. These people were sold to Thai fishermen who took them out to sea, worked them until they starved to death and then threw them overboard. It happens all the time. The problem got so bad that the United States Senate's Foreign Relations Committee and the United Nations both but put out reports in recent weeks excoriating Thai and Malaysian authorities for selling Cambodian and Burmese migrants to Thai boat captains, sending them to a near-certain death. "If they are unable to pay for their release," the Senate report said, "the refugees are sold into forced labor, most commonly on fishing boats." 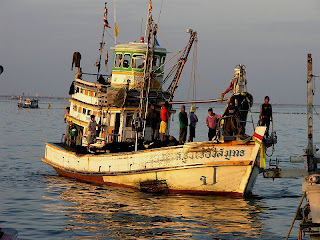 Once on the boat, "they don't come back," said Maj. Gen Visut Vanichbut of the Thai police. "All they get to eat is the fish that get left over in the net. They aren't paid. If they get sick, they're thrown overboard." When they die, from overwork or starvation, their bodies are thrown to the sharks. In most cases, no one knew the victim was on the boat, and so no one claims the body if it washes ashore. The general told me about this last year. But the United Nations report shows that the hideous problem continues at full force even now. It quotes several Cambodians who watched fishermen decapitate captives or throw them overboard. Several governments, not just Thailand's, are at fault. And by all accounts, the economic crisis is exacerbating the problem. Most of the news you hear from Thailand these days involves the riots and demonstrations to overturn whatever government happens to be in power. No one talks about the fishing-boat problem. The fishermen pay off the police. The police then cover up the crimes, and so hundreds of victims continue to die month after month. If a victim manages to survive, then Thailand is well-equipped to care for him and then use international agencies to help send him home. The Thai government has shelters and administrators whose jobs are to help human-trafficking victims. I have seen them. The shelters are quite nice. And that serves as a stark illustration of a noxious paradox that afflicts human-trafficking enforcement in Thailand, Cambodia and much of the world. When human trafficking first came into focus for law-enforcement a decade ago, legal and political officials everywhere put primary emphasis on protecting the victims - the people who were lured into slavery and abused. Stories a decade ago of police and immigration agents jailing and then deporting the trafficking victims along with their captors horrified human-rights advocates, and their complaints were quite influential when the first human-trafficking laws were drafted. That victim-oriented approach has held firm all these years, and "it has proved to work perfectly for the Thai," said Lance Bonneau head of the International Organization of Migration office in Bangkok, his tone oozing disgust. His organization works with the Thai government to send trafficking victims back home to Cambodia, Burma - just as other IOM officers do all over the world. "If you 'have' the victim," Bonneau told me, "there's no pressure to go after the traffickers" who are paying off the police. "It doesn't upset any of the arrangements the police have" with the fishing boat captains, the brothel and dance-club owners or others who enslave hapless victims. The traffickers can pursue their unconscionable work; the police can continue taking their kickbacks. When the State Department researches its annual Trafficking in Persons report each year and asks Thailand what it is doing to fight trafficking, the Thai can point to their anti-trafficking laws and to those lovely shelters for victims. Usually, that's enough to save Thailand from a poor rating. Thailand officials responded to the Senate and United Nations allegations with angry denials. Maybe in Washington's next report, it will look a little deeper at Thailand. Many government authorities are interested in putting nominal efforts to countermeasure human trafficking to be qualify for the US aids. To keep them from recording a poor rating on the State Department research, the Thai government,for instance, has implemented an anti-human trafficking laws and built shelters for trafficked victims. But, it has not yet attempt to figure out how to prosecute the endless chain of corruption between the police men and the traffickers, which essentially allows human trafficking to perpetuate in the country.